Ronaldo, O Fenômeno, scored more than 300 career goals. His talents are best remembered via Web 1.0 fan sites. It is the summer of 2002. Ronaldo, the finest striker of his generation, is winning the World Cup with Brazil. 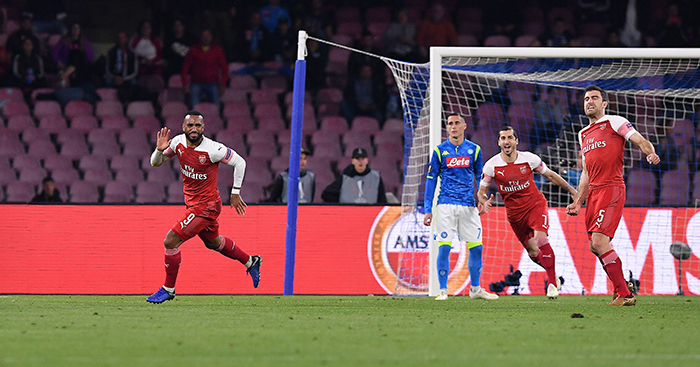 His hair, shaved but for a distinctive semi-circle above his forehead, is discussed across the globe as he scores eight goals and wins the Golden Boot. His performances – and a Lazarus-like return from injury – will earn him a move to Real Madrid. Meanwhile, it is the summer of 2002 on the internet. Your friends are patiently downloading A Rush of Blood to the Head on Kazaa. Windows XP has replaced Windows 98. There’s no WhatsApp, no Paddy Power app, no app whatsoever in fact. Hordes of Ronaldo devotees are asking Jeeves for information about their hero. 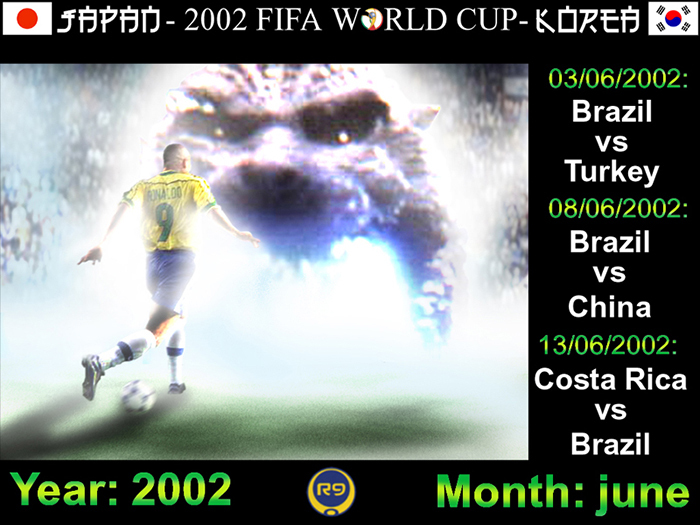 They find it: first at r9ronaldo.com, the official site of Ronaldo Luís Nazário de Lima, and then in other places — darker places, stranger places. In their search, they discover the unofficial Ronaldo fan sites of the early 2000s. R9 Ronaldo is a clean, multi-language website that closely follows the life and career of its subject, Brazilian striker Ronaldo. Browsing its pages, you can find news, images and non-football-related games (Connect 4, Snake and ‘Beer Man’ are some of the better options). You can even “send special cards to your friends and parents with the best pictures of Ronaldo”. Slightly underwhelming is the section of the website labelled ‘TOP SECRET’, which mostly contains supportive messages for friends and team-mates. The R9 Ronaldo shop offers Ronaldo-branded bucket hats, travel bags and other objects. 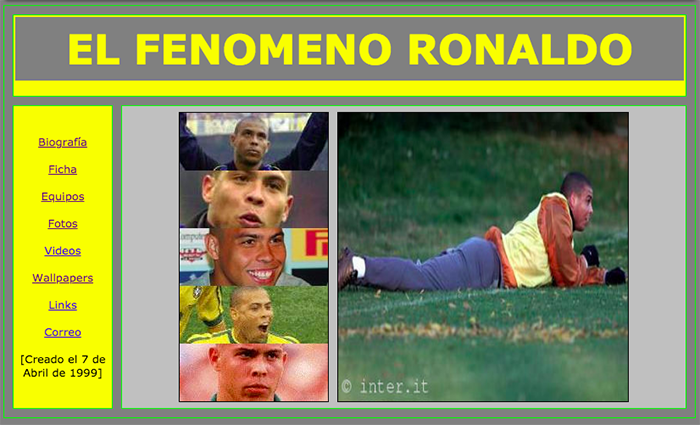 Even for a website of the early 2000s, El Fenomeno Ronaldo is threadbare. Biography and statistics pages are both rendered in plain text. Images are kept to a thumbnail size. These faults are, however, redeemed by a mesmerising collection of wallpapers — each a Microsoft Paint masterpiece. One of the best parts of Ronaldo: The Soccer Legend is its ‘Misc’ photo gallery. It delivers on that promise. There’s much more than just visual content, though. The rest of the site is a treasure trove of information and insight. “Ronaldo bought a pizza parlour for his dad Nelio in Rio de Janeiro, with the help of Ronnie’s sister, Lone,” the website explains on its ‘Facts’ page. According to Ronaldo: The Soccer Legend, Ronaldo’s favourite colour is blue, his favourite actor is Sylvester Stallone and his favourite painter is Vincent Van Gogh. All I Want is Ronaldo is, without doubt, the greatest website on the internet. And for one reason only. Disadvantage: “My header is bad”. Food: Ronaldo loves food. Ronaldo’s favourites are: Brazilian meat with bean and potatoes or fish, he also loves Mango, Hamburger, Macrao, Coca-Cola and Lollipop. Music: He loves the Funki music, he has more than 3000 CDs (!!!) and he listens to them in a Hi-Fi worth more than $20,000. The glossary originally appeared in La Gazzetta dello Sport, but the translation takes it to another level. Visitors can also download a selection of Ronaldo screensavers and Winamp skins. Most of Ronaldoweb has disappeared into the ether, but what remains is a glorious cocktail of Word Art and bright colours. It is autumn 2018 and Ronaldo has bought a controlling stake in Real Valladolid for £27million. All of his fan sites have been deleted. Neymar, Brazil’s next great hope, is criticised for his hairstyle at the 2018 World Cup. He posts a selfie with Drake on Instagram.